CPCS International will very soon start an health program with ambulance services targeting local resident specially disadvantages children from Suspa Kshamawati VDC. 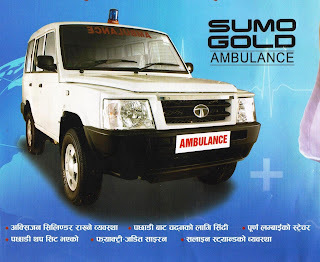 Ambulance is expected to reach in Dolakha on July 2016. Ambulance will be branded TATA 4X4 four wheel drive which is suitable for hill and mountain drive. Dolakha district is mountainous region and most affected by devastating earthquakes 2015. People are facing problem of livelihood and health.